Richard Johnson (1755-1827) is one of Australia’s forgotten pioneers. Born in Yorkshire to a gentleman farmer, he earned a degree at Cambridge and was ordained in the Church of England. 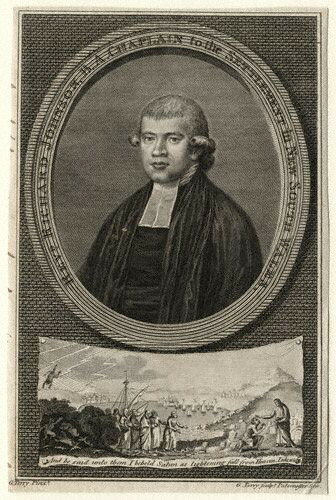 When the British government drew up a plan to transport convicts to New South Wales, Johnson was appointed chaplain to the proposed colony and set sail with the First Fleet. The colony of Sydney was established on January 26th, 1788, and on February 3rd, Johnson conducted the first Christian service under the trees in Sydney cove. For the first few years, the attitude of the governors toward him ranged from indifference to hostility. Johnson worked tirelessly, but made little spiritual impression on those under his care. He once complained that the more he preached, the more depraved his hearers became! He returned to England in 1800, feeling that he had accomplished little. However, history shows him to have been a remarkably important colonial pioneer. Perhaps Johnson's most significant early contribution was in agriculture. He had spent his young life on a Yorkshire farm, and was reckoned the best farmer in the new colony. As early Sydney teetered on the brink of starvation, his efforts were invaluable. "I believe few of the sick would recover if it was not for the kindness of the Rev. Mr Johnson, whose assistance out of his own stores makes him the physician both of soul and body." Johnson was also a pioneer in education, and the first generation of colonial children owed their schooling to his labours. He recruited teachers from amongst the convicts, raised funds for their employment, provided reading books, and taught lessons himself. When the first official Sydney school opened in 1798, it met in Johnson’s church, and he served as superintendent. He also spent countless hours visiting convicts, distributing spelling books and Bibles, and encouraging the literate to help the illiterate. Johnson made valuable contributions in other areas too, such as the law, convict welfare and indigenous relations. These efforts, driven as they were by the convictions of his faith, embody a truly "public" Christianity. The Richard Johnson Lecture, named in memory of the first chaplain, seeks to examine the place of Christianity in public life—its legacy and contribution to the common good. Written by Craig Schwarze for the Centre of Public Christianity.